Since adding my IPhone 6 Plus and GoPro Hero4 to my travel gear, I’ve been considering leaving the Digital SLR at home. I don’t need the extra weight. Now that I have an Olloclip too, I think my SLR days are numbered. The Olloclip is a lens system containing four unique lens in one, and the new design works with both the front and rear-facing cameras. Before getting rid of gear that’s always been in my bag, I wanted to test out the Olloclip on my new IPhone 6 Plus. I’m just getting the hang of an IPhone over an Andriod as well so it’s all new to me. The lens system includes a fisheye, wide-angle, 10x, and 15x macro lens. 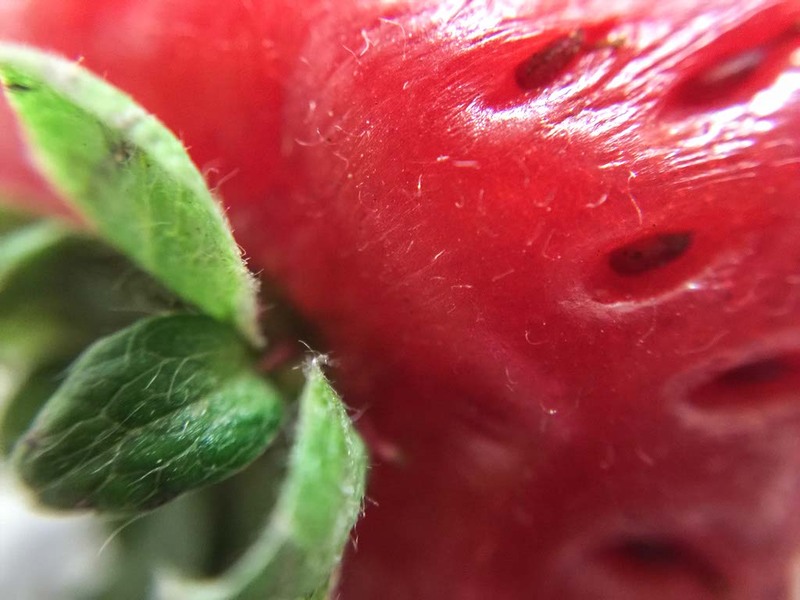 I took photos of a strawberry to test it out. It was simple to attach to my phone, but it won’t fit if you have a case so it needs to bare all in order to work. The fisheye lens captures approximately a 180 deg. field-of-view. The wide-angle lens nearly doubles the iPhone’s normal field of view. The 10x macro lens adds 10 times the magnification with a 18 mm focus distance and the 15x macro lens adds 15 times magnification with a 12 mm focus distance. The strawberry wasn’t a great test subject for the fisheye lens or the wide-angle lens but imagine the photos I’ll be able to get during my Antarctica expedition. They’re going to be fantastic. Olloclip comes with a wearable pendant, making it the first wearable smartphone lens and a better fit for travelers tight on space. Though similar to lens available with larger DSLR cameras, these lenses are sized small enough to fit in a pocket, purse, or hand. I’ve clipped the pendant to my key ring so I always have it on hand. I don’t go anywhere without my phone anyway so now I have four lens on me at all times too. I might not be ready to do all trips without a DSLR but the Olloclip is a simple, small addition to my gear that will make a world of difference. *The Olloclip website shares photos taken with olloclip on the bottom of the page. Check it out for inspirational shots or hashtag #ollocilp on Instagram to see your photos on the Olloclip site. I love iphone photography and do not intend to change to a camera due to the freedom it gives me. But this add on is amazing. I recently had my photographs published in the Essex Life magazine. All taken from my iphone and I intend to continue in this way. This is when I love technology! It’s amazing the quality photos that can be taken with an iPhone, right Janice? During most trips, my DSLR sits in my bag unused.